Edina Jackson is an author and businesswoman who wrote her first children’s novel after being inspired by her newborn son. She offers a variety of marketing strategies that don’t cost much money. 1. Pretend for a moment I’m a parent looking for a book for my child. Pitch me your book in five to ten sentences. 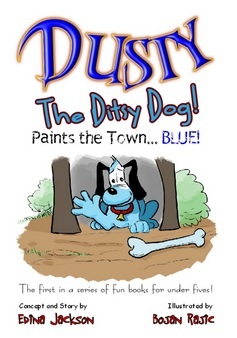 Dusty the Ditsy Dog is a fun, vibrant, easy to read book for the under fives. It does not just tell a story, it has a message behind it. The message is that if you put your mind to it, you can change the world. It is a is fun book with a positive message. Your child will enjoy getting to know Dusty and his friends in the fictional setting of Mistytown. Going down the route of forcing your book down a publisher’s throat did not appeal to me. With e-books, and other book formats, the publishing industry has taken a hit. They are not publishing books like they used to. I decided to publish my book without the help of a large publishing house because I wanted to retain the authenticity of the story. I decided to go with a small publishing company called BrightSpark Publishing. I published in association with BrightSpark and my own company Intrigue Media Group. I feel like I have more creative control, and I am able to decide how I want my book to be marketed. Like I said, my publishing deal was a collaborative one. So, it was a combination of indie and traditional. So far it has been an interesting experience. BrightSpark has helped me with the marketing side of things. I have done two virtual book tours. I did various guest posts on blogs, was featured on various online magazines and was mentioned in a wide range of online articles. I have also visited schools, nurseries and libraries, as well as book fairs. I have used Twitter and LinkedIn, as well as plenty of article marketing. I have found that going to schools and nurseries and talking to the parents has helped a lot. The virtual book tours have been fantastic as well. I have tried not to go down the route of constant blog commenting for the sake of getting my name out there. Instead I have opted for contacting the owners of relevant blogs and asking them if I can do a guest post. Or if they can feature me on their site. Spam is not a good thing when it comes to promoting any kind of business. I have learned that it takes time, you have to be patient. Before I thought that you could print your book and put it out there and everyone would rush to buy it. I have found that you have to plan and prepare, work out a strategy and stick to it. I don’t think I would do anything differently. I think that everything I have done so far has been a learning curve. I am happy with the choices I have made so far. I would say be resourceful, think outside the box. You might not have a million dollar budget but you can still make a splash if you know how to get things done without spending loads of money. For example, do a good deed and create some publicity for your book at the same time. Donate some of your books to the local nursery. This is the kind of thing that will provide a story to a local paper. Do some research and find out how to put together a press pack, including a press release, bio and photograph. Send this out to local papers, local radio, and even to independent book stores in your local area. Organize a small book tour in your local area and branch out once you have built a name for yourself. There are so many strategies you can adopt without having to spend large sums of money. There are nine more Dusty books which will be coming out in the future. I am also currently putting together a poetry book and a novel. So, you just have to watch this space. I also have my own copywriting company so I am always working on that. Inspirational, colorful and beautifully crafted. All the books I am going to be releasing will be on my website, edinajackson.co.uk. You can also catch me on Twitter @writingthedream, where everything to do with my work and my business will be announced.